I hope you are all having a lovely week so far. Today I am going to be raving on about +Tanya Burr's new baking book called "Tanya Bakes" and sharing with you guys the first recipe I tried out using her book. If it's not apparent already, I am a chocoholic, I love chocolate, I am addicted to chocolate and chocolate brownie is definitely a guilty pleasure. Soo if you haven't guessed it already by the title of this post or the picture, I tried out her Salted Caramel Brownie! Oh my god, this was amazing. Let's just stop here! I don't need to rave on about this because it's so damn amazing and you guys need to go and purchase her book right now and try out this recipe before you continue reading this post. I'm joking, but it is great! Or am I not joking? One thing that really stood out to me with this brownie is the density of it. It's a very thick brownie but the thickness gives the brownie it's fudgyness. I was so concerned when it said bake for only 20-25 minutes because of how much mixture was in the tin, but it generally takes 30 minutes. If you want more of a gooey brownie then 25 minutes is also a perfect time to cook this for. Doesn't the look of this make your mouth water? Make it now! In the recipe Tanya tells you to pour half of the brownie mixture into the tin, then pour over the caramel then pour the rest of the brownie mixture on top to create three layers. However, we decided to make it all swirly and to have the caramel running through the whole of the brownie instead of having just one layer. I think this is better to be honest but it's your choice of how you want to make your brownie. If you want to make this recipe then carrying on reading! Preheat your oven to 180 degrees and line a tin of your choice. Melt the butter and dark chocolate together then whisk in the sugar. Once you have done this, whisk in the eggs and vanilla extract until the mixture is light and bubbly. Carefully fold in the flour and cocoa powder, trying not to knock out any of the air. Pour half of the mixture into your desired baking tin, then pour the carnation caramel over the top. add your sea salt flakes and distribute these evenly. Once you have done this, pour the rest of the mixture on top of the caramel. 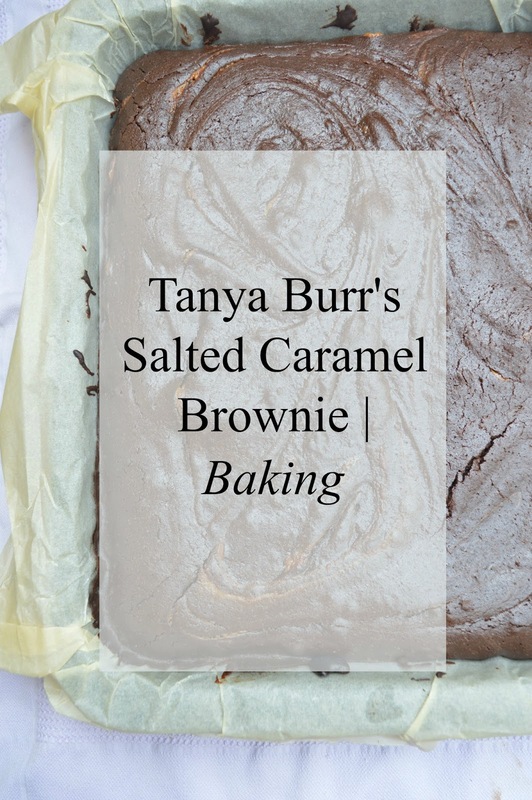 Let me know if you try out +Tanya Burr's Salted Caramel Brownie! If you do, you will absolutely love it if you enjoy chocolate as much as I do. Send both myself and +Tanya Burr pictures via instagram or twitter. I'm sure you all know her details! I love making these brownies! Do you know if you are able to freeze them?